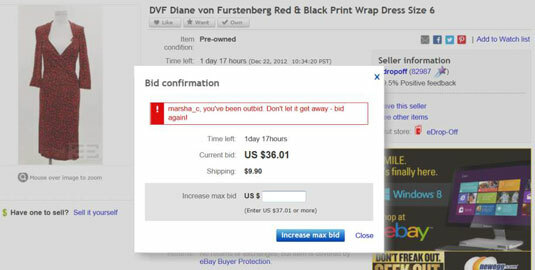 To give you a sense of the eBay auction process, here’s a real-world example. Say you searched and found an item you wanted, “Home-baked Snickerdoodle cookies.” (Yes, you can find real food in the Home and Garden→Food and Wine category!) After reading the seller’s feedback (and skipping lunch), you want the item even more! None of this seller’s previous buyers were unhappy with the product. For a dozen cookies, the starting bid is $6.95, and the auction ends in over four days. So you need to observe several things about the auction. How many more are up for sale on the eBay site? A simple search shows that only one is up for auction. What did they sell for in the past? You have to make some decisions and observations as a buyer, even if all you’re after is yummy snacks. Because these cookie auctions have an active bidding pattern, at this early stage, you decide to bid the minimum amount just to get the item to show up as one of the items in the my eBay page→Buy→Bids/Offers area. Bidding can be like a game of poker. If you want to win a one-of-a-kind item, don’t show your hand to other bidders. Simply mark the auction to watch. Note, however, that this strategy isn’t necessary for an item that will be sure to be listed again. When it comes to auctions, the highest bid wins. Remember this, please. People are constantly boo-hooing because they’ve been outbid at the last minute. You can’t be outbid if you’re the high bidder! Bidding on eBay goes up by a prescribed bid increment, which is the minimum amount by which your bid can be raised. But what if you’re not able to sit in on an auction 24 hours a day, 7 days a week, upping your bid every time someone bids against you? You do receive e-mail messages from eBay (or notifications on your smartphone app) to let you know that you’ve been outbid, but you may busy doing other things and you might not get the notice in time to place a new competitive bid. If you’re interested in an item but you don’t have the time to follow it closely from the beginning of the auction to its conclusion, you can place a proxy bid using eBay’s automatic bidding system to place your bid for the highest amount you’re willing to pay for an item — without spending your valuable time constantly following the auction. Instead of waiting it out with eBay’s automatic bidding, you can also go to the seller’s eBay Store to see whether a duplicate item is for sale at a fixed price. Or, if the seller has set a Buy It Now price and (again) you’re too impatient to wait until the end of the auction to win, click Buy It Now and go from there. Before you place your proxy bid, you should give serious thought to how much you want to pay for the item. When you place an automatic bid (a proxy bid) on eBay, eBay’s bidding engine places only enough of your bid to outbid the previous bidder. If there are no previous bidders and the seller has not entered a reserve price, your bid appears as the minimum auction bid until someone bids against you. Your bid increases incrementally in response to other bids against yours. Type your maximum bid in the appropriate box, or click the Place Bid button. A confirmation page appears, and you have one last chance to back out. If everything is in order, click Confirm Bid. Or, if you get cold feet, click Change bid. After you’ve placed your bid, the next page lets you know whether you’re the high bidder. The confirmation page tells you if you are the high bidder. If you’re not the high bidder, just click the Increase max bid button and place another bid. You’ll often come across auctions that have the words Reserve not met next to the bid amount. By placing a reserve price on the auction, the seller ensures that the item will not sell until the bidding reaches that mysterious reserve figure. Private auctions are handled in the same way as plain vanilla auctions, except only the buyer and seller know who the winner is. As a matter of fact, all bidders’ names are hidden from anyone other than the seller. After you’ve been on eBay for a while, you might see the same group of names bidding on the same auctions as you.